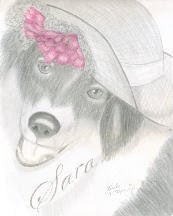 Pencil Sketch Artist, Becky Terpening is doing a series of pet portrait sketches for an upcoming pet book. Get a 5”X7” portrait pencil sketch of your pet for $60 (Value $150) or upgrade to an 8”X10” for only $40 more (Value $250). Finished sketch will be in a mat and ready to frame. Also include a pet story (400 words or less). Pet sketches and stories will be featured on this blog and will be displayed in several businesses. Story and sketches may appear in newspapers, magazines and other advertising.